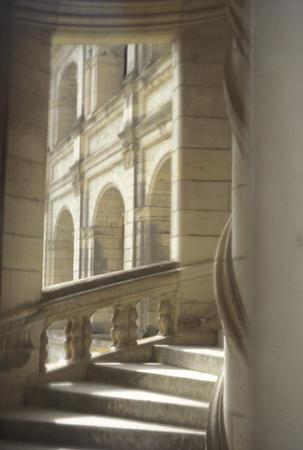 This is the staircase designed by Leonardo da Vinci in Chateau Chambord in the Loire Valley in France. It was photographed through very old glass in an interior hallway. Leonardo, reportedly disgusted with the Italian political situation at the time, was lured to France by King Francis I. He spent his final years at Clos Lucé, continuing with the prolific output of his genius. It was a profoundly moving experience to be in the same rooms where he lived, worked, breathed, thought and died.